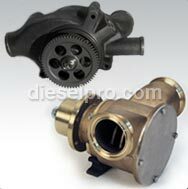 At Diesel Pro, we strive to make buying parts as easy as possible. That is why we have incorporated an easy to use website that arrange parts by engine series and type. This means you don’t have to look through annoying lists of product numbers to try to find the right part, just a simple, straight forward way to shop. Plus, we offer several shipping options, clearly laid out by time-frame and by price, so you can get the part when you want, for a price that fits your budget. Our parts also carry warranties, so you can be assured that any part you get from Diesel Pro will be up to the high quality standards you demand. If you need anything, our friendly and knowledgeable staff will help guide you in the right direction, or help you locate a hard to find part. What could cause my engine to run below normal temperature? This could be due to a damaged thermostat seal. If your engine operates in cold climates then an engine hood should be used, along with radiator shutters. This will help the engine operate normally, especially if you leave the engine idling for long parts of time. The engine temperature is high, despite the water circulating properly. What could be the problem? Check the fresh water pump for scale or deposits. These can build up over time and reduce how well the pump functions. The fan belt and openings for the radiator should also be checked, if the fresh water and raw water pump seem to be working fine. The water does not seem to be circulating. What else should be checked, besides the water pump? Check the hoses and thermostat as well, since these can malfunction over time. Make sure the water pump impeller is not loose on the shaft. Also, be sure to check the suction side of the pump, to make sure that there is not an inadequate water supply. 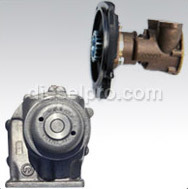 A clogged radiator, a bad keel cooler, a bad cylinder head seal, or a thermostat housing vent valve that is not open can all lead to a lack of water entering the pump.